The beautiful peninsula near Caracas Bay offers plenty of calm scuba diving and snorkeling sites. Caracas Bay is the large bay connected by a narrow strip of land, or dam, with Spanish Water, southeast of Willemstad. There are two huge piers, often used for docking large cruise ships and passenger vessels. A hilly walking track will lead you across rocky terrain and the historic Fort Beekenburg, built in 1703 to protect the entrance of Willemstad. This huge natural deep-water bay and connecting peninsula offer water activities such scuba diving and snorkeling. 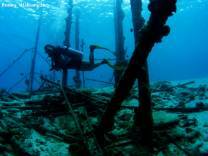 There are a few dive sites of interest to divers such as the wreck of the famous sleepboot and the mini wall dive Kabaye near Director's Bay. The reef sits close to shore and entering the calm waters is easy from Baya Beach.